Imagine getting to know a business leader who is so inspirational, generous, and courageous that he or she dramatically expands your thinking, elevates your career, and improves your life. For me, this was Ed Tuck, who passed away ten days ago at 85 years old. Maybe you don’t know Ed’s name, but you definitely value and use his invention everyday: GPS. In the 1980s, with a commercial pilot’s license, Ed would fly himself to meetings throughout California. When he was often re-routed to small airports due to poor weather, Ed envisioned a GPS device that could tell him where exactly he was and needed to go – whether it be in air, on land, or on sea. He formed a company called Magellan and began assembling an engineering team. I remember he told me he spent a year pitching venture capitalists, saying, “With watches and clocks, we know our position in time. With a GPS device, we’ll finally know our position in the world.” He was rejected and embarrassed by 85 potential investors: “It’ll never work,” or, “It’s too big an undertaking.” The naysayers made him even more passionate and committed. The 86th thought it was a genius idea, and soon after Magellan and Ed launched the world’s first portable GPS device. Years later Ed became an angel investor in cutting-edge tech and health startups. 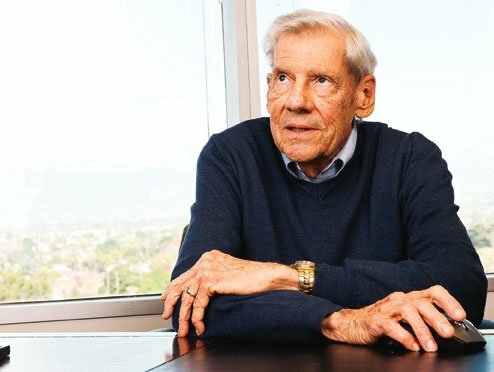 When he contacted me about co-founding a scientific matchmaking business (at the time he was 73 years old and still arriving into his office each day at or before 8 am), of course I jumped at the opportunity to build a business with such a remarkable engineer and successful entrepreneur. I was hungry to hit a financial home run and eager to fill the big shoes he was expecting. – Blur the line between work and play. Our brainstorm sessions felt less like a job and more like discovery and fun. Through shared creativity, mistakes, and ah-ha moments, he became a trusted friend and no longer an intimidating role model. – Inject some humor. Ed started every presentation with a relevant Far Side or New Yorker cartoon. It calmed the room and helped us not take the situation — or ourselves — too seriously. – Time and expertise are never wasted when they’re given to others. I will never forget how he coached me through writing and filing patents, taught me how to estimate the cost of making a product that has never before been made, and trained me in scenario planning. – Surrender the floor, don’t dominate it. Ed effectively led all meetings – whether it be Board, potential client, or team meetings – by talking the least and absorbing the most. – Welcome the doubters. He warned our team that we’d be called crazy and laughed at many times, but we could use that as fuel for determination and humility. – Discrimination can kill a company. Treat everybody the same: young, old, high or low rank. Each person’s job is as important as another person’s job; if this isn’t true, the organization needs fixing. It was an honor, joy, and once-in-a-lifetime blessing to work with him, and now it’s my duty to pass on wisdom and encouragement as he did. This article is my first step. ** You can read Ed’s obituary here in the LA Times.